You can currently catch Ruth Wilson in the Broadway play 'King Lear' and last night(April 4th) she attended the opening Night Party in New York. Ruth never plays it safe when it comes to her fashion choices, which is why the ERDEM SPRING 2019 'Jessamine' dress is right up her style alley. 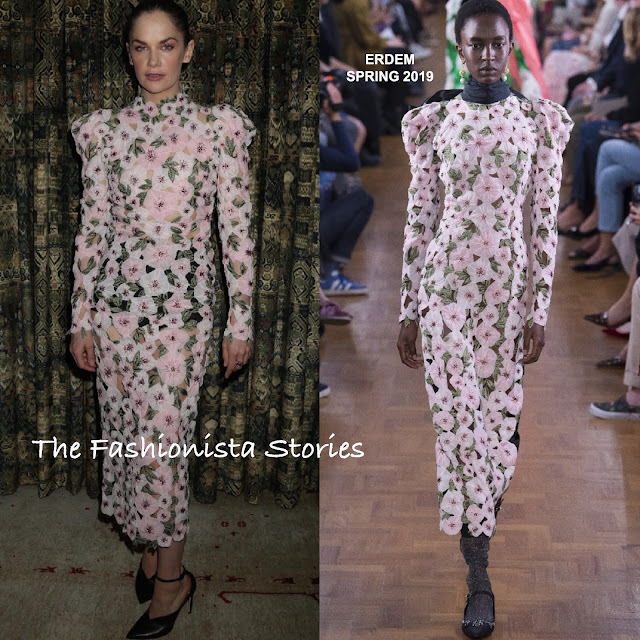 Her dress featured a pink floral embroidered front pant and a contrasting sold black back panel. Her dress which was layered with black briefs for coverage, was done in a midi length. The embroidered dress was offset with black ankle strap pumps by JIMMY CHOO, which topped off her look along with an up-do and pink make-up.